In the past year, the US, India, China, Japan and the European Space Agency have all made plans to head to the moon sometime in the next two decades. 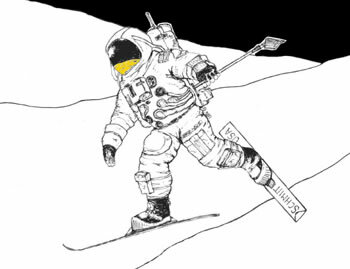 An recent NASA article is chock-full of valuable tips from Apollo astronauts on an alternative means of lunar travel first suggested by Robert Heinlein - namely, skiing. "Oh, boy, it's beautiful out here! Reminds me of Sun Valley," Apollo 15's Jim Irwin declared from the Hadley Rille. With lunar soil like "soft powder snow" Mount Hadley Delta strangely resembled "Dollar Mountain at Sun Valley, a practice hill with great skiing conditions." "In the moon's low gravity, you can ski above the moondust--and I did. Imagine swinging your arms and legs cross-country style. With each push of your toe, your body glides forward above ground. Swing, glide, swing, glide. The only marks you leave in the moondust are the toe-pushes." It's not as far-fetched as it sounds; after all, people do "ski" down the dunes at places like the Great Sand Dunes National Park in Colorado. However, moondust is even more abrasive than sand. Earth-sand grains measure about 250 to 500 microns across, and have rounded edges; moondust is about 100 microns across and has sharp edges. Astronauts will need new materials; Teflon is probably too soft. But, with at least fifteen years to go before anyone returns to the Moon, we've got plenty of time for development. You might also enjoy learning about the Lunocycle, a specialized lunar bicycle, from Heinlein's 1952 novel The Rolling Stones. Recent moon stories related to science fiction works include Moon dust substrate for solar panels and lunar dust fountains as predicted by Hal Clement. Find out more at Apollo Chronicles: Jack Skis the Moon; thanks to Fred Kiesche at The Eternal Golden Braid for the tip on this story.